Patrick Mahomes may be back in pole position for the MVP. He had another 4 TD game and is over 40 on the season, adding 295 yards plus 52 more on the ground. He outdueled Derek Carr's 285 yards and 3 TDs. Russell Wilson needed only 11 completions to throw 4 TDs, and Josh Allen put up a shock monster game with 231 yards and 2 TDs passing plus a huge 135 yard day on the ground. A lot of monster QB names disappointed. Jared Goff and Aaron Rodgers had juicy matchups against the Lions and Cardinals but turned them into barely 200 yards and just one TD. Drew Brees and Matt Ryan couldn't even manage that, both finishing below 140 yards with one score. And Andrew Luck was even worse as his Colts were shut out in Jacksonville. Todd Gurley returned to form with 2 TDs and 165 combined yards, though he scared owners on one late TD run as he pulled up at the two before eventually punching it in. Undrafted rookie Philip Rivers nearly matched him, rushing for 157 yards and two TDs. Tarik Cohen did a bit of everything, catching 12 passes for 156 yards, rushing for 30 more, and even throwing a TD. Christian McCaffrey and Ezekiel Elliot both had their usual big games, each over 130 combined yards with a score. James Conner found the endzone twice before leaving hurt. This week's hot waiver Austin Ekeler was a huge bust, turning 18 touches into just 43 yards as rookie Justin Jackson broke out in his stead. Tevin Coleman continued to disappointed, getting just 7 touches for 11 yards. Both Saints RBs disappeared. Alvin Kamara had 36 yards by land and sea but fell way short of expectations, and Mark Ingram had only 28 yards total. Marlon Mack and Dion Lewis finished under 35 yards and were far short of workhorse status. 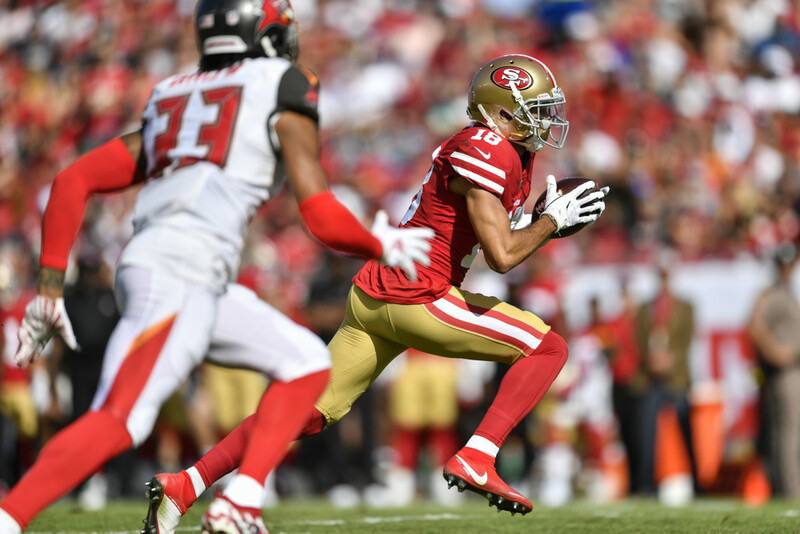 Dante Pettis (San Francisco), Zay Jones (Buffalo), and Jaron Brown were this week's three 2 TD receivers. If you started any of those guys, let alone all three, you're a witch. Keenan Allen was a PPR monster with 14 catches for 148 yards and a TD as he outdueled Antonio Brown's 10 catches for 154 yards and a score. Odell Beckham Jr. only had 35 receiving yards but caught a TD and threw his second of the season, a 49 yarder. Shield your eyes, there's some big names here. Julio Jones was MIA with just 2 catches for 18 yards. Tyreek Hill caught only one 13 yard pass, though he at least added a long run. A.J. Green returned from injury to catch one 7 yard pass before leaving hurt again. Emmanuel Sanders caught 4 balls for only 19 yards. Michael Thomas had 5 catches for 40 yards. That's not any good either, but it's practically transcendent compared to the rest of those guys (or his Saints teammates). Week 13's top tight ends came from the same game. Jared Cook had 7 catches for 100 yards and a TD, but he couldn't hold a candle to Travis Kelce's fantasy TE game of the season. Kelce had 12 catches for 168 yards and 2 TDs, and he dang near added a third. Just when we thought Rob Gronkowski was back, he disappeared again with 3 catches for 26 yards. David Njoku had only 8 yards, and Greg Olsen caught only one ball before leaving hurt again.